Even the handsomest fireplace grows dirty over time. And given enough time, the mantel, accessories, and other decorative elements can grow stale, as well. But there’s good news for homeowners and other fireplace owners: breathing new life into a fireplace installation doesn’t have to cost a fortune. Whether you’re looking to increase your fireplace’s heating efficiency or just give it a new lease on decorative life, you should understand your fireplace’s assets and challenges first. First, consider the chimney, both indoors and out. Older chimneys, particularly those in damp climates, tend to spring leaks and cracks that, as water freezes and thaws inside them, actually feed on themselves. Over time, this can cause serious structural damage. A leaky chimney leaks heat! If you’re not comfortable working with mortar or concrete, consult a building contractor for chimney repair estimates. Shop around a get several quotes. If you own a gas fireplace, you should also have a plumber or certified technician inspect your system for damage caused by debris, wear and tear, and other problems. One of the major ways you can bring a new look to an old fireplace is by investing in a new screen or set of doors. 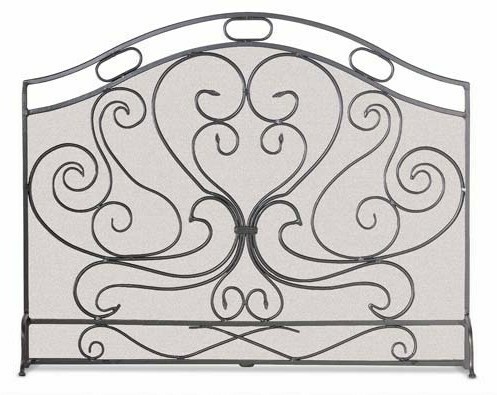 Much like the front grill of a classic automobile, a fireplace screen or door set will add shine, depth, and presence to your fireplace presentation. If you’re going to paint your chimney or firebox, you need to find the right paint. Heat-resistant paint is available from online and retail stores. However, heat-resistant and heat-proof paint only work in very specific circumstances. It’s important to read all labels and advisories before purchasing. Fireplace technology has kept pace with the times, and modern fireplace models often feature electronic and remote controls, variable settings, and a wide range of decorative options. But all those features and attractions can prove daunting for first-time buyers. If you’re fixing up a fireplace you’ve had for years, or purchased as part of a residence, the road to perfection can also seem confusing. Keep reading to discover the basics of modern fireplace shopping and buying. 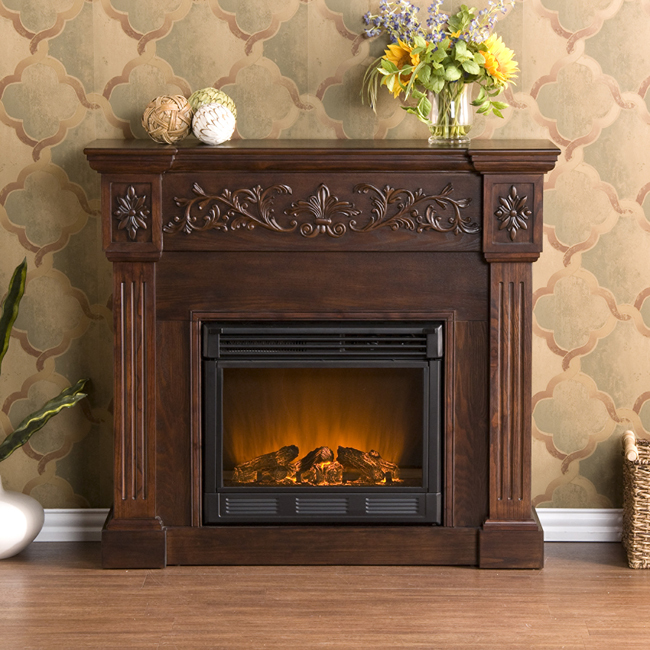 The classic fireplace image includes wooden logs aflame inside a generously sized fireplace. Yet the modern wood-burning fireplace, while retaining its traditional operation, also includes a variety of decorative and safety features meant to maximize its users’ warmth and safety. 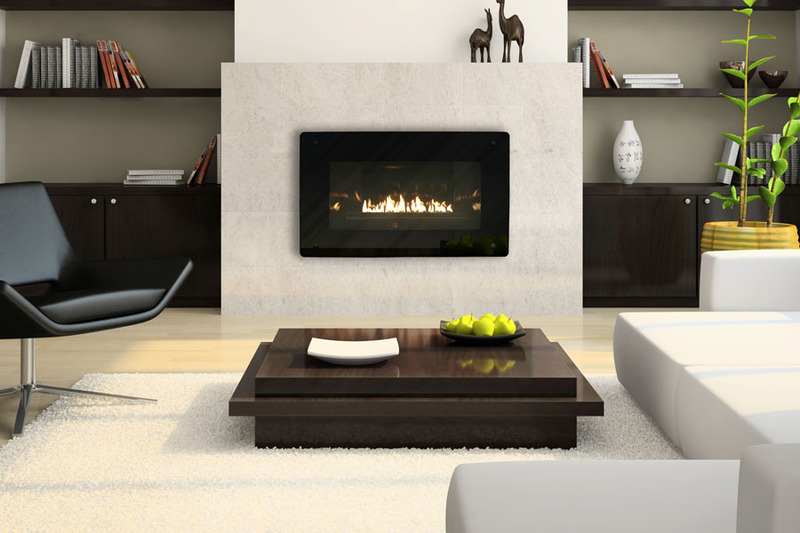 Fireplaces’ great advantage lies in their elegance and charm; however, modern gas and electric fireplaces have largely outpaced them in regards to fuel economy, heat production, and convenience. Still, there’s no mistaking their traditional appeal, and for those with old-time decorative sensibilities their allure is probably irresistible. Gas logs are permanent fireplace installations that swap out an existing or new fireplace’s wood-burning capability for either natural gas or liquid propane. They are also available as part of specially-made fireplaces that are constructed to maximize their warming potential. 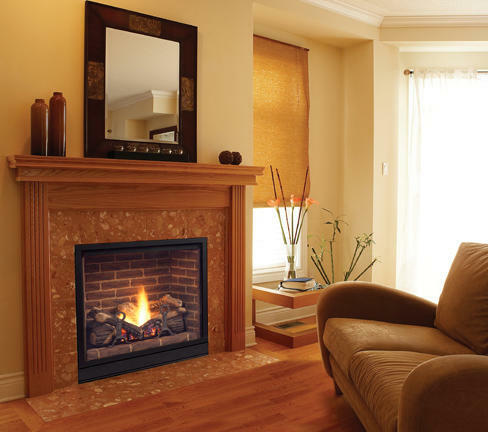 Natural gas fireplaces produce almost no exhaust, and can typically run from a house’s existing gas line. Liquid propane fireplaces burn hotter than natural gas, giving them greater heating capacity. However, operating a liquid propane fireplace often means switching out or refilling the propane supply tank. In addition, liquid propane supply service may not be readily available in all areas. In either case, gas logs should be professionally installed by a licensed plumber or heating technician. It’s also crucial to make sure your fireplace can accommodate the size gas log set you want. A helpful sizing and measurement guide is available here. Learn more about gas logs by reading our special guide. Linear fireplaces measure longer and narrower than conventional square-shaped fireplaces, allowing them to be installed inside walls and above existing structures. Also called panoramic or wide-view fireplaces, linear fireplaces’ viewing areas are usually four times wider than they are tall. Virtually all linear fireplaces will be gas-operated. 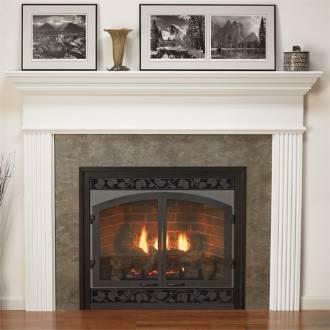 Direct Vent and Ventless Fireplaces: Which Is Right for Your Needs? Choosing between direct vent (or vented) fireplace systems and ventless (or vent-free) fireplaces largely depends on your home or business’ exhaust capabilities. Vented gas logs use chimneys or stovepipe to expel smoke, ash, and other effluvia away from the fireplace’s surroundings. Vented gas log sets are typically less expensive, but also less productive – they emit less heat. Ventless gas logs and fireplaces are more efficient than vented models, not least because they do not lose heat through their exhaust systems. They also create less pollution than vented models. 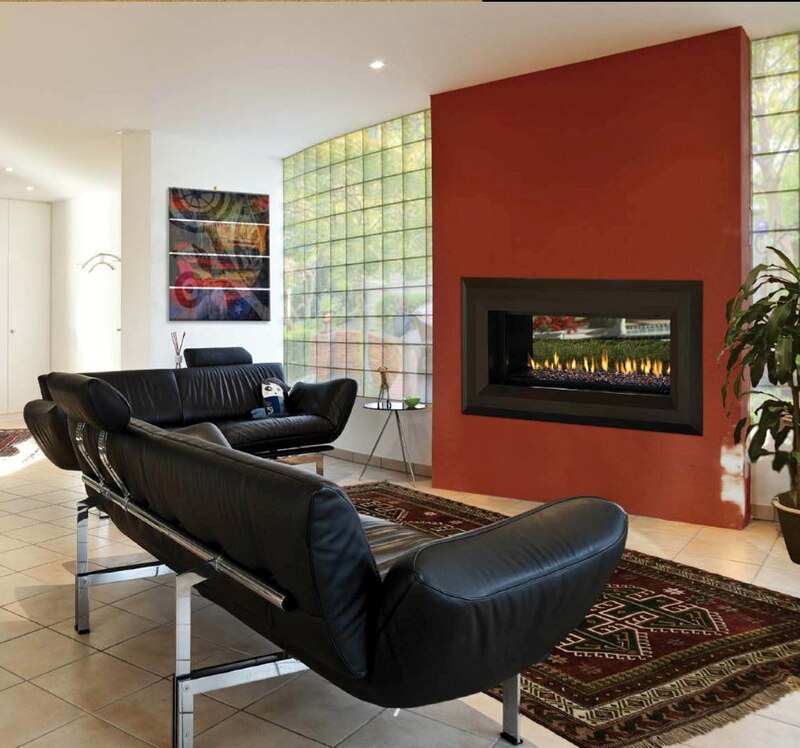 Despite their advantages, ventless fireplace systems have their drawbacks: they tend to consume more of the oxygen in their surrounding area, and cost more than vented models. Many electric fireplaces retain classic Americana design details. The great advantages of electric fireplaces? They’re incredibly clean and require much less effort to operate and maintain than wood-burning fireplaces and gas logs. 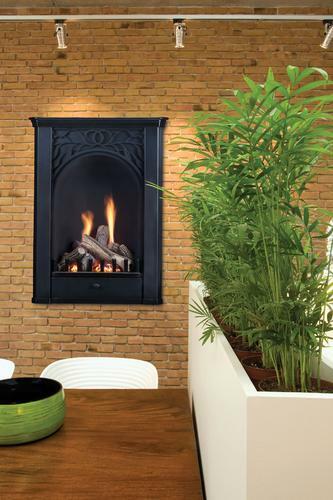 Electric fireplaces also require no venting, as they produce no exhaust. 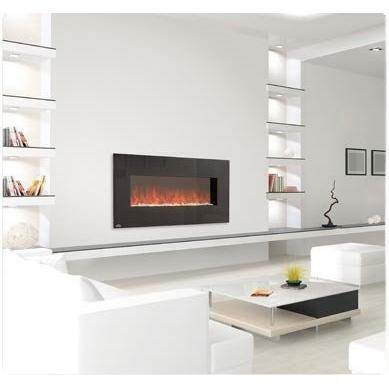 Modern electric fireplaces use LED technology in conjunction with electronic controls to create electric “flames” that are often comparable from the real thing. They’re also available in a wide range of decorative styles, from traditional to ultra-contemporary. Wall-mounted and smaller-sized models also allow installation in many additional parts of the home – bathrooms, guest bedrooms, and others. 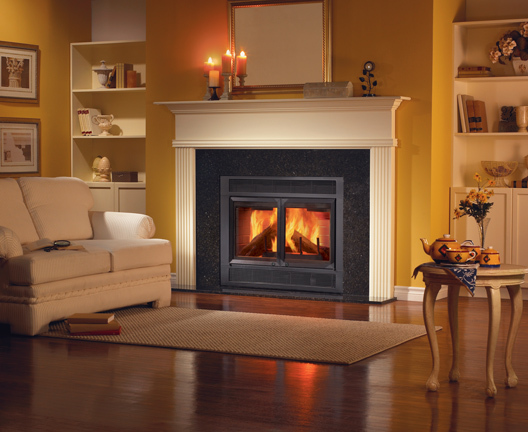 You can learn more about electric fireplaces by reading this helpful article. In many ways, the fireplace insert combines the best advantages of all other fireplace styles and models while possessing very few of the drawbacks. As the name implies, the fireplace insert is a self-contained fireplace unit that fits inside existing chimneys and exhaust systems. 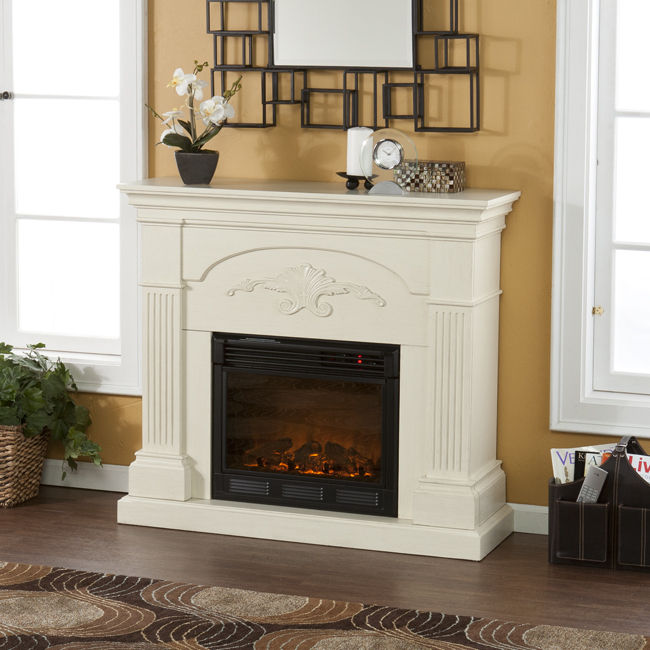 Many models of fireplace are self-contained, or ventless. 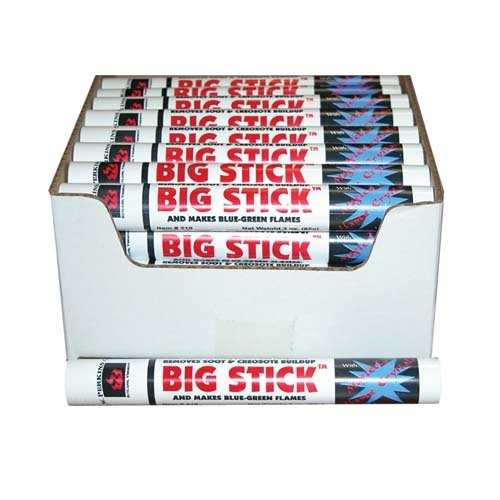 This allows them to be used inside the fireboxes (the open areas at the bottom of the fireplace’s chimney) of chimneys or exhaust columns that have become blocked or sealed off by damage. Fireplace inserts are available in wood-burning, gas, and electric varieties. For a complete guide to their use and maintenance, read our Guide To Fireplace Inserts elsewhere on this blog. We’re sure they’ll have fireplaces in the future. The firebox is the open area beneath the chimney shaft, or flue, and behind the hearth. The firebox houses the firewood, gas log and/or pipes, and other fireplace machinery or equipment. The surround of a fireplace is the area immediately around the firebox edges, facing towards the surrounding room. A fireplace’s flashing seals the open gap between the edge of the fireplace insert and the edge of a surround. 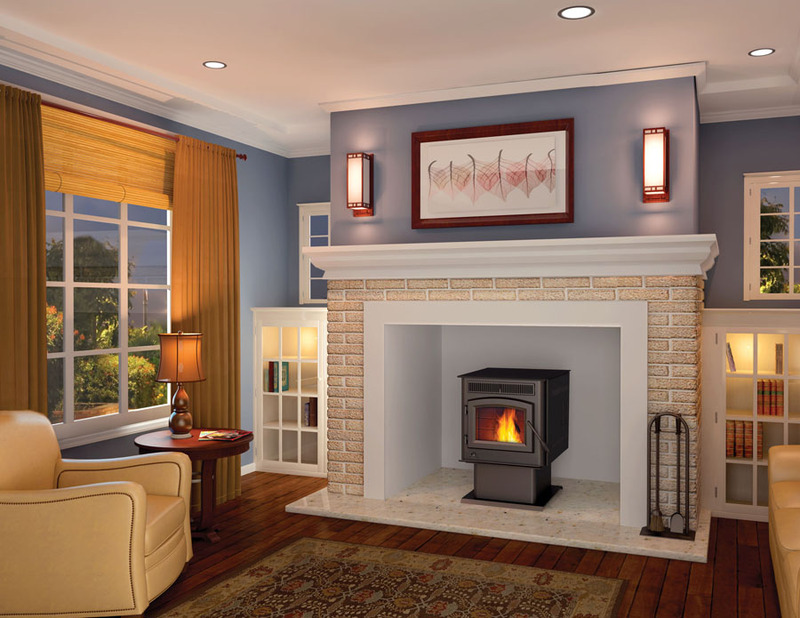 Flashing units give a fireplace insert a seamless look that joins with their surround. The mantel is typically made of wood, marble, or another highly durable material. It fits on the exterior of the fireplace, above and around the surround. By long-standing tradition, a mantel’s shelf is a display space for family awards, mementos, photographs, and keepsakes. 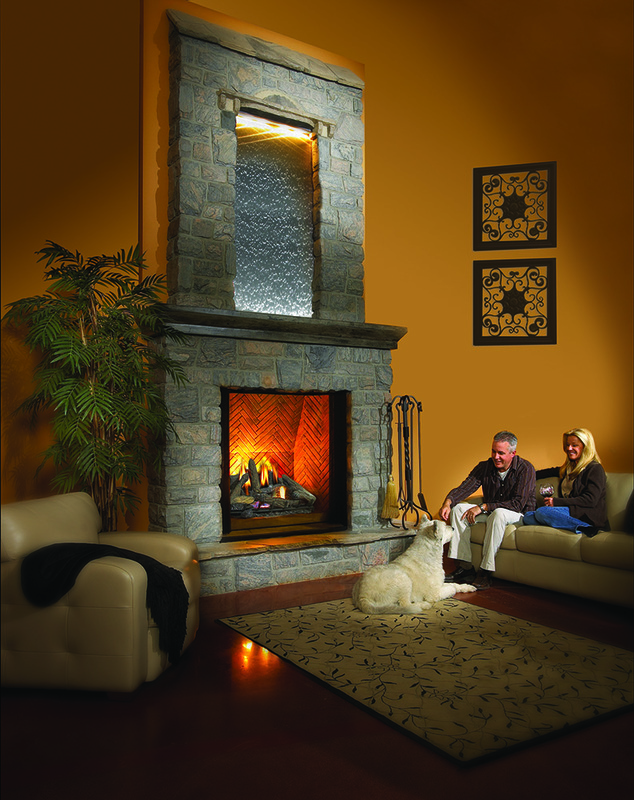 Our customer service staff is happy to answer your questions about any kind of fireplace and fireplace installation. 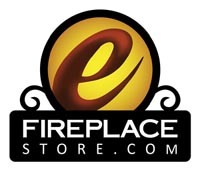 Just email them at info@efireplacestore.com for a prompt reply. For as many as one million American homeowners, the pellet-burning stove represents the cutting edge in home heating technology. Environmentally friendly thanks to their recycled fuel source materials but still possessing most of the same modern controls and conveniences of traditional fireplaces, the pellet stove (or pellet wood stove) continues to draw new fans as home heating costs continue to rise. The modern pellet stove uses specially-constructed “pellets” composed of recycled sawdust and other biomass material. Yet the pellet stove is actually not a recent innovation, and traces its roots back to one of the United States’ most pressing economic emergencies. At the same time, the modern pellet stove offers attractions and inducements that energy- and cost-conscious homeowners will find almost impossible to ignore. Burning sawdust and scrap lumber in barrel stoves, braziers, and other simple stoves has been common practice for hundreds of years. However, in 1930, near the beginning of the Great Depression, the first wood pellet, the Presto-Log, was invented at a sawmill in Lewiston, Idaho. For much of the Depression, as scarcity and high prices continued to make heating oil expensive, the burning of wood and wood by-products continued to grow. Over time, the pellet stove continued to evolve, eventually gaining widespread public notice in Washington state during the 1980s. Biomass stoves and ovens became the focus of widespread research and innovation during the 1973 OAPEC oil embargo of several Western nations. In more recent years, as demands for environmentally-conscious fuel sources and continuing high oil prices drive interest in alternative fuels, pellet stoves are entering something of a Renaissance. The nonprofit Pellet Fuels Institute estimates that more than 824,000 pellet stoves were made in the United States between 1998 and 2010. PFI believes approximately one million pellet stoves are operating throughout America each winter. Pellets are made from a variety of densified biomass material, including wood, cord wood, waste paper, wood chips, and dozens of agricultural byproducts including corn and cornstalks, and many forms of forestry and forest treatment byproducts. In short, biomass is organic material left behind after any of dozens of treatments and procedures. Pellet manufacturers take these waste materials and refine them into pellets resembling pencil segments or corks; they average about the size of a small finger. Manufacturers remove most of the material’s moisture, in order to increase BTU capability and make the pellets easier to use in freezing conditions. Modern pellet stoves are a far cry from the straightforward “burn bins” of yesteryear. In fact, many of them share the same electronic components, remote controls, and other sophisticated features as contemporary gas stoves and fireplace inserts. The stoves receive pellet fuel from electronically controlled bins, allowing them to maintain a steady warmth output as long as their fuel bins contain pellets. PFI estimates that the average family will consume about three tons of pellet fuel per heating season, at an average cost of approximately $825. Of course, this number varies according to the size of the wood pellet stove and especially the frequency of use. 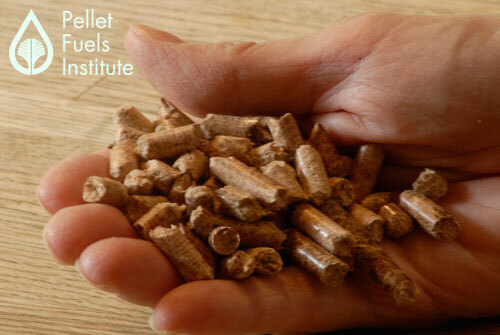 In comparison, each ton of wood pellets has the fuel efficiency of about 2.8 barrels of #2 fuel oil. One disadvantage pellet stoves face compared to natural gas and propane fireplaces and inserts rests in the refueling process. Pellet stoves require periodic replenishing of their hoppers, and some models’ exhaust may generate soot and debris more than others. Pellet stoves also share one of the chief drawbacks of conventional wood-burning fireplaces. Because they tend to warm only their immediate areas, they can “fool” household thermostats into letting other parts of the house grow cold. As such, home heating experts recommend installing the stove away from home thermostats and other heat-measuring instruments. Remember to choose a spot that leaves ample and convenient room for any necessary stovepipe and venting. 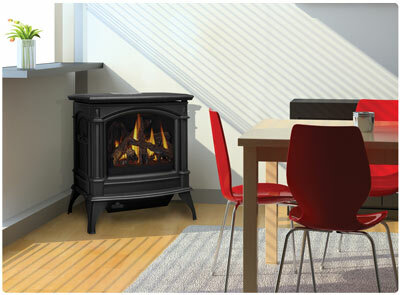 The installation and venting of a pellet stove, like a fireplace insert or direct vent fireplace, is a task best left to qualified, certified experts. In particular, consumer advocates recommend selecting an installation specialist certified by the National Fireplace Institute. They will be able to safely estimate the pellet stove’s best place in the home and to ascertain all venting and exhaust needs. Wood pellet fuels are available from a variety of online and real-world retailers. The Hearth, Patio, and Barbecue Association provides a free locator service on their website. Your fireplace is a crucial part of your home heating capability. But is your fireplace working the best it possibly can? Many homeowners and fireplace users seldom realize that the fireplace and chimney that have served them well for years may now need maintenance or restoration – or even replacement. Luckily, modern fireplace construction and venting technology, along with innovations in fireplace maintenance and repair, have made keeping fireplaces in their peak condition both simple and affordable. With winter coming, consider taking the following steps to maximize your fireplace and chimney’s heating potential. Chimneys can “bleed” heat if cracks and fissures in their masonry or foundation are left unchecked. Warm air seeps out and cold air seeps inside, finding its way into the firebox and making it more difficult for a fire to heat the surrounding interior room. Moreover, cracks and fissures actually “feed” on themselves. As water seeps in and then expands as it turns to ice, the brick or masonry crumbles and the dilapidation spreads. Experts recommend getting your chimney checked for cracks and holes at least once a year, either by yourself or by a chimney or foundation expert. The means of sealing your chimney will depend, of course, largely on the type of chimney your fireplace has. A variety of maintenance and repair accessories are available both in stores and online. For more serious repairs, hiring a bricklayer, carpenter, or other contractor will likely prove necessary. To keep your home warm even when the fireplace is not in use, make sure the damper is closed whenever the fire is completely extinguished. Investing in a damper hook will make this task less time-consuming and physically awkward. The tops of chimneys are favorite nesting spots for birds, but those same nests can block the chimney’s flue (the airway above the firebox), hampering ventilation and increasing the risk of fire and smoke inhalation for the house and its residents. At the same time, airborne debris from surrounding trees can blow into the chimney as well, presenting fire and ventilation hazards. By installing a chiney pot or chimney cap atop your chimney, you’ll block birds and airborne debris without sacrificing ventilation. Many chimney caps also make beautiful additions to a home’s silhouette and exterior decorative plan. Chimney pots and caps range from simple to ornate in both appearance and decorative elements, so you have a wide range of appearance choices. Creosote is the gummy, toxic residue left behind when oils escaping from burning wood coalesce and gel alongside the chimney flue walls. Over time, creosote can literally choke off a chimney’s ventilating capability. Clean out any creosote by hiring a professional chimney sweep or by carefully and thoroughly using any of the creosote-cleaning tools available at stores and online. As a guideline, The National Chimney Safety Institute of America advices cleaning whenever creosote buildup reaches 1/8 of an inch thick. Check out our guide to keeping your chimney creosote free to learn more. As their name somewhat suggests, fireplace inserts are self-contained fireplaces that fit inside the firebox (or bottom) of a fireplace. They offer great energy efficiency potential because their sealed construction allows them to lose much less heat than traditional wood burning fireplaces. Fireplace inserts are available in wood-burning, gas (both natural gas and propane), electric, and pellet-burning configurations. They are usually either direct vent, meaning they shed exhaust by means of a stovepipe; or vent-free, meaning they are 100% efficient in burning their fuel. Vent free fireplace inserts also carry the additional advantage of working inside fireplaces whose chimney was removed or whose flue has become significantly obstructed. The insert simply slides into the obstructed firebox. For more information, please read our complete guide to fireplace inserts. Natural gas and propane gas log sets offer a cleaner, lower-maintenance alternative to traditional wood burning fireplaces. Most gas logs are constructed from high-endurance ceramic, and should be installed either by a plumber or licensed gas technician. Natural gas and propane gas logs each have distinct advantages and drawbacks. Propane gas logs burn almost three times hotter than natural gas logs. However, natural gas fireplaces can run off a home’s existing gas line, while propane tanks require both purchase and periodic refilling. For a complete explanation, please read our complete guide to gas logs. It’s easy to think of wood stoves as smaller, self-contained fireplaces. Like fireplace inserts, they are available in either direct-vent or vent-free configurations. Depending on that exhaust method, they’re suitable for use in any room in the home, especially attics, basements, and upstairs bedrooms and bathrooms that are hard to heat through conventional HVAC systems. Wood stoves come in many of the same fuel configurations as fireplace inserts: wood-burning, gas, electric, and pellet-burning. Like fireplace inserts, stoves also feature electronic controls, including electric thermostats and electronic displays, so they’re much more accurate in their heating than conventional fireplaces. A second (or third, fourth, et cetera) heat source in your home helps your main fireplace by alleviating its heating tasks. The lessened wear and tear helps delay the need for maintenance. Read our guide to wood stoves, electric and gas, and pellet stoves elsewhere on this blog to learn more. Investing in new fireplace tools, a new fire grate, or safety accessories such as hearth pads and gates won’t increase your fireplace’s energy efficiency. However, they will make your fireplace easier to operate and more comfortable to enjoy. They’ll also help improve the fireplace’s safety, both to operate and enjoy. It seems that winter home heating costs increase a little more with each passing year. Yet many families, especially those living in older houses, don’t realize they’re literally surrounded by opportunities to trim winter home heating and utility bills. The U.S. Environmental Protection Agency estimates that American families spend nearly $1,100 on home heating and cooling costs each year – nearly half their total energy expenditures. However, experts agree that taking steps now to “winterize” the home can result in steep savings – sometimes as much as 20 percent. The following energy efficiency tips don’t just work for homeowners. Apartment tenants and mobile home residents can also put these ideas and strategies into action. Just make sure to check with proprietors or property managers first. You wouldn’t set sail in a leaking boat, so why brave winter temperatures in a leaky house? Winterize your home by weather-stripping doorways and windows, sealing cracks and fissures in the window and doorframes and keeping holes in the walls and ceilings shut tight. Small cracks equal big expenses: experts say a one-eighth inch gap between a door and its frame costs as much as a six-inch wide hole in your wall. Windows, especially single-pane glass windows, are poor retainers of heat. Plastic film storm windows, available at most hardware stores and easy to install, will also trim electricity costs by better insulating your widows and window frames. Close the fireplace damper when the fireplace is not in use. Unplug outdoor appliances and electronics to keep them from passively absorbing electricity. Consider upgrading your traditional wood-burning fireplace to a more energy efficient fireplace insert. Don’t waste money by heating areas of the house that don’t get a lot of activity. Shut the doors and vents to unused or seldom-used rooms (guest bedrooms, basements, et cetera). This will better convey heat to high-traffic areas. Open all the curtains and blinds of south-facing windows, to better allow sunlight to heat your home naturally. Adding insulation to your home, especially your attic, also helps you save big. You can also add insulation to other unfinished space in your home such as basement walls, crawlspaces, ceilings, and utility closets. Installing programmable thermostats takes the constant supervision out of monitoring your home’s temperature level. Make sure the thermostat is properly installed in a part of your home that’s heated, so it can accurately monitor home heating levels. If your home’s furnace or heating system is more than ten years old, the EPA recommends getting it a thorough inspection by a licensed heating expert or contractor. You should also check your heater’s air filter every month to make sure it stays clean, and replace it when needed. Save up to seven percent on your electricity bill by dialing your hot water heater’s thermostat down to 120 degrees. You can save even more by wrapping or insulating the pipes running from the hot water heating unit to the wall. Wrap the heating unit in an energy-saving heater blanket or jacket (available at most hardware stores). Consider buying a newer, more energy efficient heater: most water heaters have twelve-year life spans; older units will likely need servicing or replacement. Drain a bucket of water from your hot water heater before the cold weather truly sets in. This will remove sediment and granular matter that accumulates inside the pipes and “prime” your heater for the months ahead, making ti run more effectively. Save on laundry costs by washing your clothes in cold water, and running only full loads. Running cold-water laundry loads decreases the washer’s energy usage by 75 percent. Take shorter and cooler showers; install low-flow showerheads to slash hot water expenses as much as 16 percent. As with the window and door gaps, save money by caulking or sealing all cracks, fissures and openings. Downsize your home heating utility bills altogether by investing in a vent-free or direct-vent stove. Usually powered by wood, propane, or natural gas, direct vent stoves use double-walled stovepipe to funnel exhaust away from the home’s interior, while remaining much more energy efficient than conventional (or B-vent) wood-burning fireplaces. 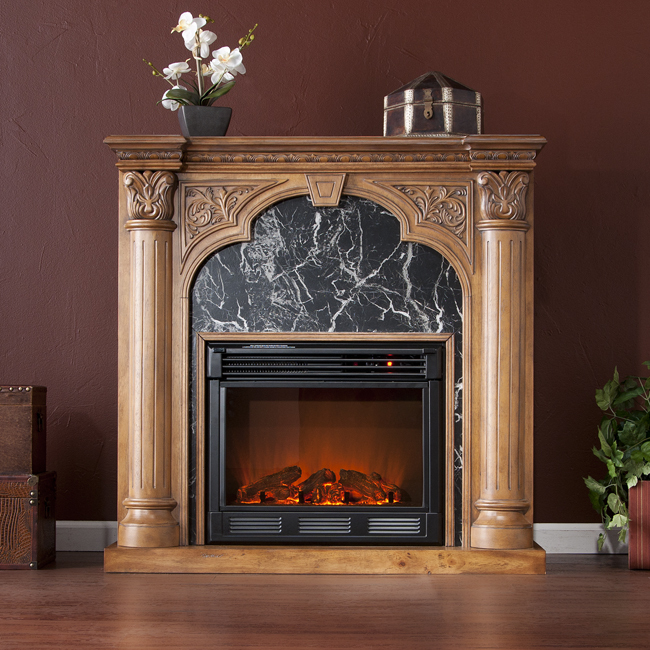 Vent-free fireplaces are self-contained (as the name implies, no venting is needed) and almost 100% efficient. Both direct-vent and vent-free stoves make excellent heating choices for bedrooms, family rooms, and basements. Electric space heaters may also offer opportunities for greater energy efficiency in parts of the home that are difficult to heat through conventional means. Energy experts recommend investing in appliances, electronics, and heaters with the ENERGY STAR certification, which are certified by the EPA as using 20 – 30 percent less energy than comparable, non-certified products. Visit the official ENERGY STAR website for more information. Gas logs are gaining popularity among homeowners looking for a lower-maintenance alternative to wood-burning fireplaces but who still want the warmth and elegance of real flames. They make a clean-burning, energy efficient home heating solution, and modern gas log design and construction allows for dozens of design choices. In their simplest definition, gas logs are permanent fireplace installations that go inside a custom-made or converted fireplace and operate using either natural gas or liquid propane as fuel. 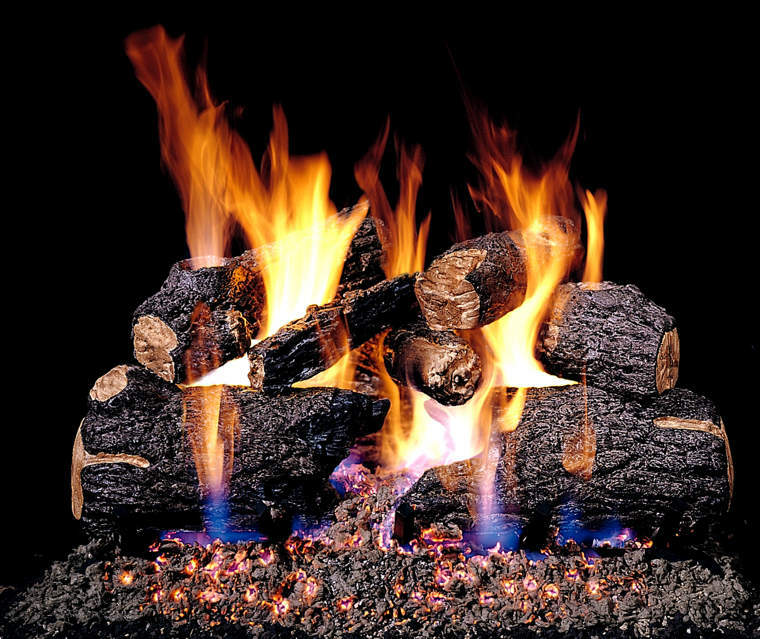 Most gas logs are constructed from ceramic materials that are molded and tested to resist very high levels of heat. The name “gas log” is somewhat misleading. Most models are in fact very carefully sculpted and detailed to resemble the wooden logs of a traditional wood-burning fireplace. However, other models are made to resemble decorative stones, crystals, and ultra-modern geometric ornaments. These “contemporary” gas logs function just as effectively as traditional gas log models but offer different design options. 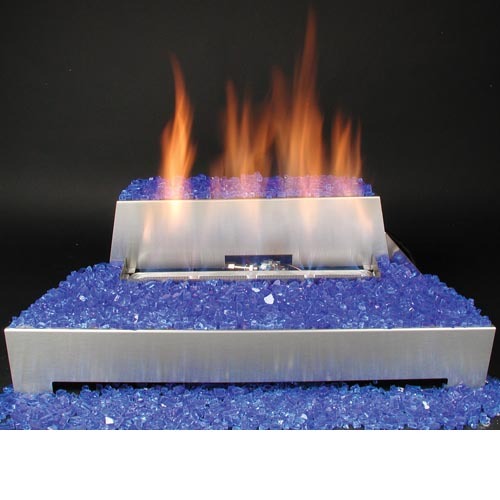 Gas log sets run on either liquid propane or natural gas, and each has its own sets of advantages and drawbacks. Liquid propane burns nearly three times hotter than natural gas, making it a powerful home heating solution. Because most models run on fuel supplied by tanks situated outside the home, it makes a great heating solution in areas where piped-in natural gas service is not available. However, propane gas log sets are more expensive than natural gas sets, and usually require contracting with a propane retailer to refill or replace tanks. Natural gas log sets are very clean-burning. Because the natural gas used is lighter than air, the exhaust dissipates during combustion. And because many homes are pre-equipped with natural gas service, installing or maintaining external fuel tanks may not be necessary. However, natural gas lacks the same heating capacity as propane. Finally, service may also not be available in all areas. Installation of either set should be attempted only by a plumber or licensed gas technician. Local ordinances and regulations may also determine whether you can have propane or natural gas log sets in your home. As their names imply, vented and ventless exhaust systems take opposite approaches to dealing with combustion by-products. Vented gas log sets use chimneys or stove pipes to funnel smoke and ash, carbon monoxide, and other debris out and away from the firebox. Ventless (or vent-free) gas log models are almost entirely self-contained. Though less expensive than ventless models, vented gas log sets produce much less heat than vent-free models. They do, however, produce a more traditional-looking yellow flame. Ventless gas logs are more fuel-efficient and powerful than vented models, partially because they do not lose some of their generated heat through the exhaust vent. They produce less pollution than vented models, and can be used inside a fireplace or even inside a self-contained cabinet. However, they will deplete oxygen in the rooms where they’re used, so carbon monoxide and oxygen level monitors are required for their operation. Ventless models are also illegal in California and some other areas. When deciding on a gas log set to function inside an existing fireplace, it’s vital to make sure the gas log is not too large for the firebox. The logs themselves should have two inches of clearance on either side between their ends and the firebox walls. In addition, fireplaces should be a minimum of twelve inches deep to safely accommodate most gas log sets. The logs should not be longer than the rear firebox wall. The fireplace should also be large enough to allow room for the control systems, as well. A helpful sizing and measurement guide can be found at our website. The simplest type is the manual on/off switch. An operator opens a gas control valve and strikes a match to ignite the flames, which are regulated by opening or closing the valve. 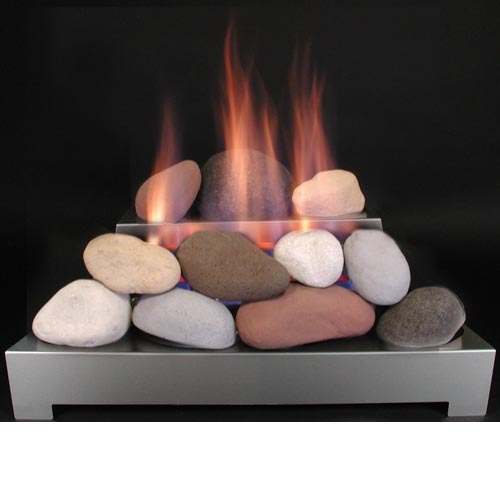 Though simple to operate, they cannot work with propane gas logs or ventless models – only vented natural gas sets. The second type, the manual safety pilot valve, resembles the operation system of a hot water heater or furnace. A pilot flame is lit by hand and used to regulate the fuel reaching the logs. The pilot light can be turned off in warmer months to save on fuel costs. Though safer, pilot lights offer limited flame control and cost more than manual switches. Propane gas logs must include a safety pilot light. Millivolt pilot valves, also called remote-ready pilot valves, function much like traditional manual safety pilot valves with one important difference. They can be connected to an external control source such as a wall switch or remote control device. In fact, some of these remote control devices are sophisticated enough to allow control of flame height, intensity, and other gas log features. Millivolt pilot valves are more expensive than other control systems, however, and take up the most space within the firebox. Gas log accessories include everything from extra logs, stones, and other decorative elements meant to enrich the set’s overall aesthetic effect. In addition, many varieties and kinds of tools and cleaning products (soot remover, carbon remover, et cetera) are available, as well as remote control system upgrades and extras. Though they’re a more recent innovation than gas or wood-burning fireplaces, electric fireplaces are quickly catching on with homeowners who want the beauty and energy efficiency of traditional fireplaces but without the limitations those other models often carry. 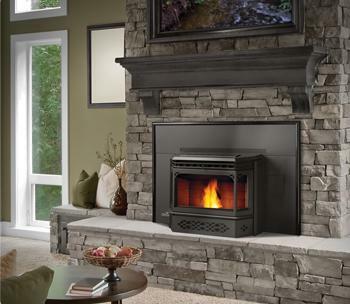 One of the great advantages shared by virtually all electric fireplaces involves price. Generally speaking, they cost much less to install and operate than wood-burning or gas log fireplaces while needing very little maintenance and upkeep. Beyond cost, buyers will also find themselves enticed with a host of attractive features. Electric fireplaces are self-contained and require no venting because, like space heaters, they produce no smoke or debris. Because they do not rely on smokestacks, chimneys, or pipes to draw their exhaust away from their setting, they’re often used in rooms where chimneys or venting pipes wouldn’t be possible – basements, upstairs bathrooms and bedrooms, and game rooms. Electric fireplaces are also often used in place of traditional fireplaces and where fireplaces are no longer operational. These models, considered fireplace inserts, rest inside the fireboxes of chimneys whose flues are obstructed and demolished, restoring the beauty of the fireplace without needing the fireplace’s exhaust system. 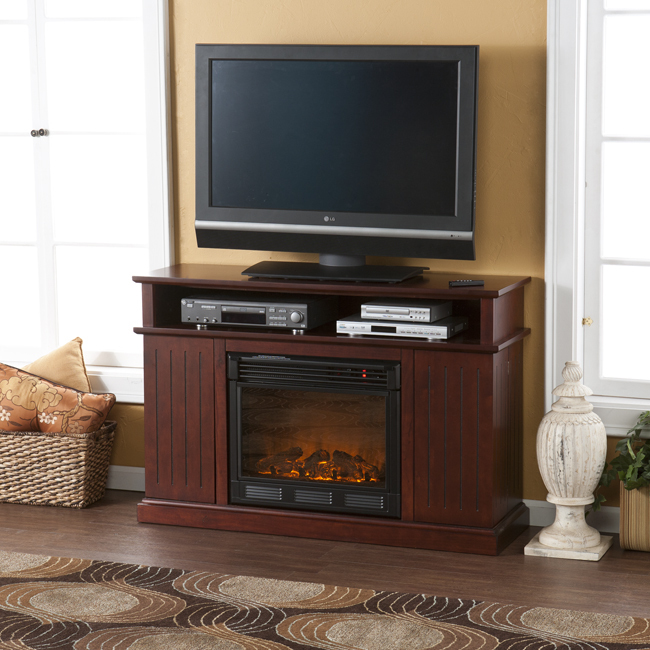 Some model electric fireplaces combine a fireplace unit with another furniture amenity or convenience: for example, a fireplace built into an entertainment center or bookcase. Other models are compact enough to hang from a wall. Still others are built on rollers, and can be taken from room to room throughout the home. A product with a vast selection, there are actually dozens of different models available from several manufacturers. The electric fireplace isn’t a very recent innovation, but advances of the last few years have made them more cost-effective and realistic than ever before. The first electric fireplaces appeared in the early 1980s, but it wasn’t until late in the following decade that models with truly realistic flame effects became available. Today, many electric fireplaces combine LED light technology with electronic controls to produce “flames” that are practically indistinguishable from actual fire. Much like the lights of an automobile, these LED (or light-emitting diode) lights can be very finely-tuned while remaining long-lasting and energy efficient. Such sophistication presents a variety of options for the electric fireplace user. Electronic controls – standard on many electric fireplace models – bring two big advantages over most wood-burning and gas fireplaces. Because the electric fireplace is electronically controlled, owners can enjoy a greater degree of precision in selecting its warming output. Some models feature digital thermostats that allow choosing the exact degree of heat that’s desired. Users can also select the brightness of the flames or turn the flames off and let the fireplace function much as a space heater. Another great advantage: electric fireplaces are as simple to turn on and off as any appliance. In fact, many come with remote controls for additional convenience and comfort. Compared to wood-burning and gas models, electric fireplaces are virtually maintenance free. They require no cleaning beyond the normal housekeeping given to other furniture. And because they do not use actual flames, there is no ash, soot, or char residue left to clean and remove. For this reason, electric fireplaces make ideal home heating alternatives for the elderly, persons with respiratory problems, and for those wishing to avoid costly and time-consuming chimney and flue upkeep and repair. Modern electric fireplaces run the gamut of style and decoration motifs, from the ultra-modern to a range of traditional and classical styles. Some models come with reinforced mantels, making them ideal pedestals for wide-screen televisions. Some also feature real wood, metal, and ceramic mantels that boast top-of-the-line artistry and craftsmanship. When choosing an electric fireplace model, consider the decor of the fireplace as well as the space limitations or potential within the room(s.) Fireplace dimensions are found on product pages and inside instruction manuals, as are power requirements. In general, electric fireplaces are not weather-proof, and should never be used outdoors. As with any electrical appliance, it’s vital to follow all safety precautions and to use qualified and/or licensed personnel for all maintenance and repair. Fireplaces are lovely to look at and an important source of warmth in any home they’re used. But the care and maintenance of the chimney, hearth, and firebox are responsibilities that require regular vigilance and attention. For seniors and others living with limited mobility, these tasks can become extremely difficult, even insurmountable. And when left alone, neglected or misused fireplaces can present life-risking danger. The U.S. Centers for Disease Control and Prevention reports that deaths from fires in the home are most common in people 65 years of age and older. Besides normal fireplace maintenance and care, seniors and their families should practice these additional safety practices to help avoid disaster and insure a healthy home atmosphere. Fireplaces should include screens, doors, or covers that protect the surrounding room from flying debris and ash. Hearths should stand nine to 18 inches off the floor to provide ample height clearance and to facilitate cleaning and refueling. Experts recommend equipping seniors’ fireplaces with direct vent or self-enclosed fireplace inserts that will help keep smoke and fumes from drifting outside the firebox or chimney flue. Such fumes can damage seniors’ pulmonary systems and make breathing difficult. Seniors should avoid using wood-burning and gas fireplaces for these same reasons. The chimney flue, or airway leading to the top, should be kept as clean as possible, with professional cleanings at least once a year but whenever necessary. Besides normal ash and debris, wood-burning fireplaces are subject to creosote deposits that result when burning oils and debris coalesce on the flue walls. Professional chimney cleaning prices vary, and a variety of DIY cleaners are also available. Still, seniors with limited mobility may prefer to hire professionals to clean their chimneys for them. Especially during the holidays, the fireplace hearth and mantel make irresistible areas to showcase decorations and ornaments. The urge is easy enough to understand: with everyone gathered in the living room or den to spend the holidays together, why not make the fireplace and hearth a stage for all kinds of decorative elements? Yet cloth, Styrofoam, and other flammable materials can catch fire if struck by sparks or cinders that fly loose from the firebox. Embers and other burning debris can sometimes fly as far as three feet into the surrounding room. Seniors and their families should take care to keep their hearths clear of decorations if the fireplace is steadily used. Likewise, avoid decorations that hang in front of the firebox unless the firebox opening is reliably covered by a sturdy screen or cover. And yes, sadly, this includes holiday stockings hung from the chimney with care. Hang the stockings after the fire is thoroughly put out if complete screen coverage isn’t available. To be completely safe, avoid storing firewood near the fireplace. Keep all decorative materials outside a three-foot perimeter from the fireplace, too, including curtains, drapes, furniture, and other decorative elements. For flooring, make sure rugs and carpet are fireproof. Many antique rugs are not, while more modern fire rugs and fire-resistant rugs are available. 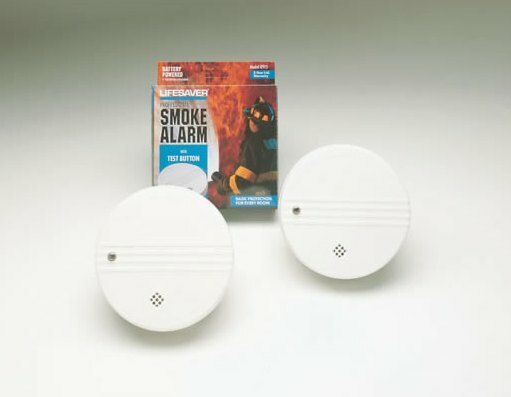 Smoke detectors work best when deployed throughout the home, especially around bedrooms and above relaxation areas. Detectors should be tested and their batteries replaced twice a year; families of seniors should help them with these tasks to avoid the danger of falling or tripping off stepladders. Fire safety officials recommend checking smoke detectors during both Daylight Savings Times but especially at the beginning of autumn. Carbon monoxide detectors are an important safety precaution in any home using a B-vent (also called “natural vent”) fireplace. Clogged B-vent pipes and poorly drafting B-vent fireboxes can allow carbon monoxide to seep into the room, slowly causing illness as their fumes accumulate. Carbon monoxide is heavier than air, so the detectors should be placed near the floor for maximum effectiveness. Children or families of the hearing-impaired can install smoke detectors and other alarms with flashing lights or other alternative means of communicating an alert. Seniors with limited or impaired mobility or memory should also use remote-controlled alarm bracelets and pins that will enable them to call for help when emergencies happen. Houses should have a clear evacuation path marked out, both from living and sleeping areas. Families of seniors with impaired mobility should speak with their local fire station, supplying any necessary information regarding the seniors’ home floorplan. The U.S. Fire Administration publishes a free guide to comprehensive fire safety for people over 50. The guide is available at the USFA website. Creosote is a toxic, potentially deadly byproduct that results when gases released from the burning of wood coalesce and settle within a contained area. Oils trapped within the wood burn, turning into smoke alongside wood particles and fly ash. As the smoke cools, it liquefies, combines, and then solidifies into a gummy, grayish or yellowish substance that’s sometimes liquid and other times more gelatinous in texture. In keeping with its unsightly appearance, creosote can be extremely dangerous. Worse still, as creosote develops inside the chimney flue (or air passagey,) it actually feeds off itself: existing creosote traps more gasses and oils, leading to the generation of more creosote. But the greatest danger lies in creosote’s flammability. Under the right conditions and when exposed to hot enough fires, creosote can itself combust, leading to a fire inside the chimney flue. The most dangerous form of creosote is known as “creosote glaze.” This occurs when new layers of creosote are formed so quickly that the layers beneath it have no time to fully dry out. The layers on top act as insulation for the layers beneath, and eventually the creosote solidifies into an almost rock-like density. Creosote can be very difficult to remove. Many professional fireplace cleaners and chimney sweeps will often resort to chemical agents to help break down the creosote’s composition, the better to remove it from the chimney. It’s dirty, often dangerous work that requires strict precautions, and can often become very expensive. Probably the best weapon against creosote is vigilance. Regularly examining your chimney firebox and flue for creosote’s early residue will let you act proactively to stop its spread. Hiring a professional chimney sweep to clean your chimney flue can often be expensive and time-consuming as you research which local chimney sweep offers the best service. For do it-yourself enthusiasts, there are a variety of solutions, powders, and tools to help first break down creosote and then safely, effectively remove its residue. These tools range from brushes and scrapers to whips and special stripping implements. Fireplace experts do recommend having a professional chimney sweep or other fireplace expert (fire marshal, et cetera) evaluate your chimney and fireplace before undertaking a creosote removal project. Make sure to exactly follow all safety precautions, including wearing protective eye wear, gloves, and breathing masks. Creosote is a known carcinogen (cancer-causing substance) so taking all precautions is critical for safety. The wood stove, or simply the stove, offers an enticing alternative to space heaters and traditional fireplaces. Probably their greatest advantage is their versatility. Many “vent-free” stove models require no chimney or venting through a home’s exterior. Others burn a wider variety of fuels than traditional wood-burning fireplaces. 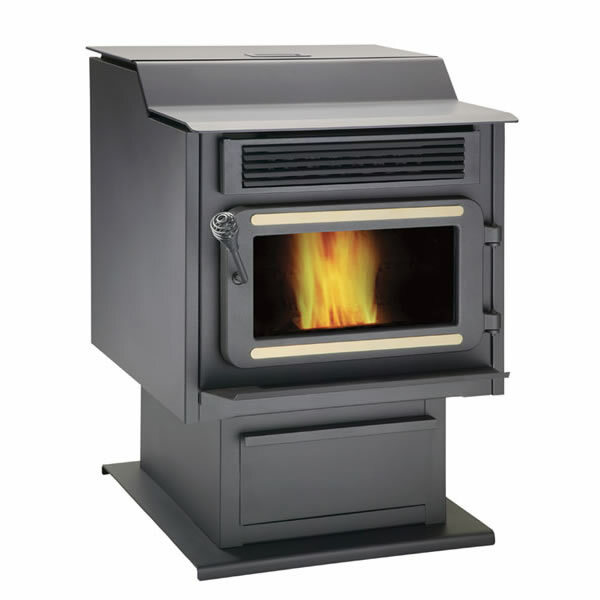 Wood stove models, despite their name, also operate using gas, electricity, coal, or special fuel “pellets” that work similarly to charcoal briquettes. Homeowners should consider their home heating needs as well as how much they’re willing to spend before investing in a wood stove. Though they are not generally expensive, the right choice of stove depends largely on personal needs and expectations. Shoppers are often surprised by the electronic features that are common among different stove classes. Electric thermostats, push-button controls and easy-to-read displays are all basic standard features. As a rule, the level of sophistication varies according to manufacturer and model. Seniors and those with limited mobility often find wood stoves to be a better alternative to fireplaces for just those reasons. Those same groups may prefer a stove because it is easier to access than a firebox or fireplace insert, which is typically embedded in a hearth or chimney. Wood-burning stoves are really only a more compact form of fireplace. 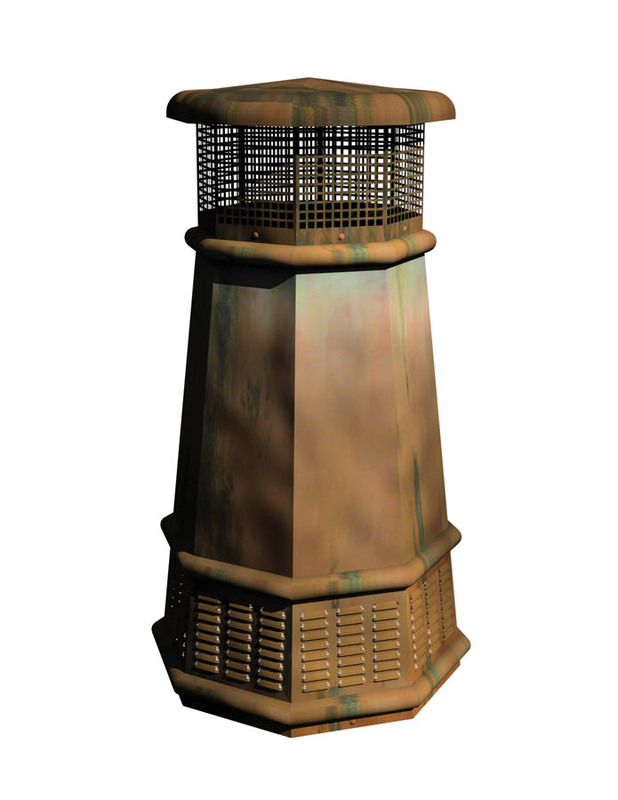 They require a direct vent, or stovepipe, to help them channel their exhaust away from their surrounding room. Electric stoves run on basic household current. They offer a greater range of placement options, but some models may not feature high energy efficiency. However, their relatively light weight and ease of installation make them an attractive choice for areas where venting is not practical. 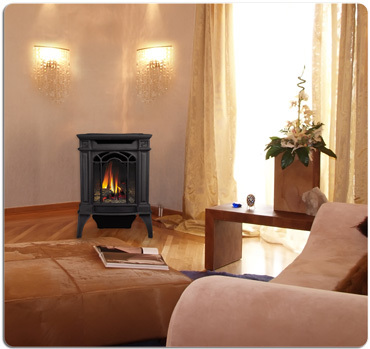 Pellet stoves use a special wood-based pellet as a fuel source. They are energy efficient compared to wood-burning fireplaces and offer more convenience than gas models. The pellet stove has seen a surge in popularity in recent years, thanks to their fuel’s composition. 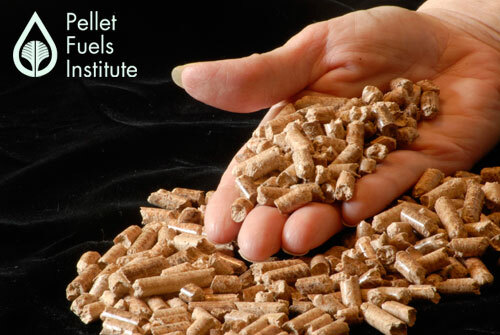 Pellet fuel is often made from compacted sawdust or other waste products created from saw milling. Because the pellets are essentially recycled waste, they’ve become popular among shoppers who value environmental sustainability. Finally, some stoves use common coal to effectively heat even larger-space rooms. They require very specific venting, and are not recommended for use inside mobile or modular homes. A stove’s venting describes its method of funneling exhaust, or smoke, away from its surroundings. There are three basic types of venting. Natural venting, or B-vents, uses air from inside the home or other surroundings. The hot air creates buoyancy that channels the exhaust through a venting system (for example, a stovepipe.) They are typically easier to install and cheaper than direct vents, but are not always as energy efficient. Direct vents, also called pipe vents, use a specially constructed, double-walled pipe to channel exhaust outside. They don’t rely on a chimney or flue, and this allows them greater placement options in the home including bedrooms, sitting rooms, and converted garages and basements. Vent-free stoves produce no exhaust and are self-contained and sealed. They make an ideal choice for limited or smaller spaces such as bedrooms, bathrooms, and basements. They are also more efficient than natural and direct vents because they retain all the heat they produce, rather than allowing some to escape through the chimney or stove pipe. 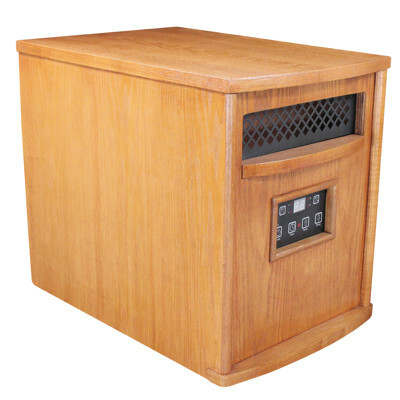 Space heaters are typically gas- or propane-fueled, and work best in areas where space is limited or a stove would prove impractical. Some are wall-mounted, while others are easily portable throughout the home or building. Like stoves, many space heaters feature modern electronic controls for easy operation. There are literally hundreds of stove accessories available for all models and fuel types. These include enhanced electronics, home cooking and brewing implements, maintenance and repair tools, remote and wall-mounted controls, and a full range of decorative elements. Before making a final decision, it’s helpful to browse what accessories are available for the stove you want to purchase. This will help you anticipate upgrade, cleaning, and repair resources for use at a later date. © 2019 eFireplaceStore.com Blog. All rights reserved.